Today is Ada Lovelace Day - a day for celebrating the achievements of women in science, tech, engineering, and math. My good friends Kerry Corrigall and Aakriti Agarwal who co-presented with me at GHC12 and gave such great tips and "careers in tech" advice to our audience. My friend and fellow robot-enthusiast Angelica Lim, who has traveled around the world to pursue graduate studies in Japan, is a globe-trotting conference speaker, and now also a TEDxKyoto speaker. She balances so many seemingly difficult things with ease even while immersed in a foreign language and culture. 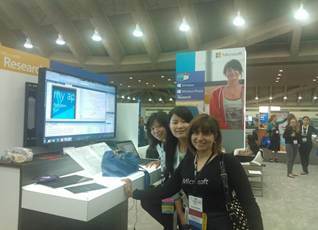 My fellow female Windows Phone colleagues at Microsoft, several of whom I worked with to get to GHC12 this year and teach others about Windows Phone app development. I look to them to see all that is possible in my career and am excited by what the future holds! The many female students who tough it out and persevere in their STEM studies and remain in the pipeline. It's so encouraging to see your energy and enthusiasm for your fields! I also found a nice infographic with lots of more well-known female role models here. Who are your female role models in STEM? Who inspires you? I'd especially like to hear about emerging stars and work I haven't heard about yet!